EXTENDED BY POPULAR DEMAND TO MAY 12! Chicago Tribune Photo of the Week - Anthony Battle performs in "Self-Accusation" at Theatre Y on April 7, 2019, in Chicago. "The practical magic of storefront theater, mesmerizing." "The show was happening before you got there. The show was always happening." "It casts a certain spell for madness as a litany of confessions." "Flourishes into a spectacle for nine actors that proceeds like a well-rehearsed fever dream." 4 Stars out of 4! "It’s not entertainment: it's visual poetry." "Theatre Y is taking on challenging work and applying soul and elbow grease to create truth." "Centered energy and deep commitment" "A period of intensity and grace" "A worthy statement of this moment in time." "I've never seen anything like this before in Chicago." "A bit like entering quicksand, disturbing, confusing, unpredictable, humorous, innovative, inspiring...A master class in storytelling." "A transformation of the theatrical form and not like a play at all." "A cure for the national stage." "To reveal what definitively happens in this play feels like a betrayal to its nature. It's a secret only to be told by this ensemble and in that sacred space. This is the most honest, poetically gut wrenching, fun house mirror like look into humanity you won't be able to unsee. Believe in the magic and go." "The amount of mystery, spontaneity, and jaw dropping yet sincere means of spectacle cannot be overstated." a demonstration of the complexities of humankind." over the course of the next ninety minutes." is ultimately about its audience." "The performance of the millennium"
"Violating the most sacred expectation of theater"
Please join us for Theatre Y’s imaginative presentation of Self- Accusation, by Peter Handke March 21-April 28, 2019. 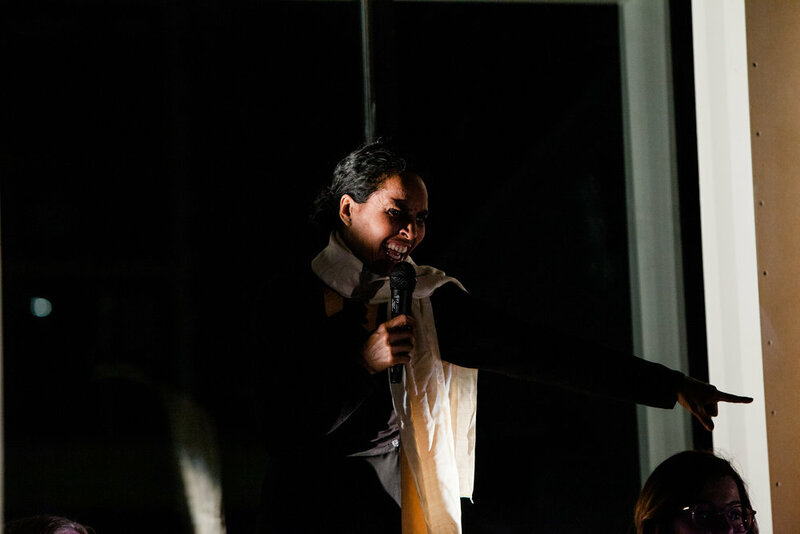 Originally written for two speakers, Theatre Y reimagines this gleefully rebellious mea culpa as a conceptual art oratorio for an ensemble of nine, staged in a storefront window with the city of Chicago itself as its backdrop. By the end of the piece we have a groups of speakers who are no longer actors, a collection of individuals who are no longer just spectators. Co-Director and Theatre Y Artistic Director Melissa Lorraine - Graduating from Northern Illinois University with a B.F.A. in acting, Lorraine became a company member of Studio K in Budapest, Hungary. Co-founding Theatre Y with now deceased Director Christopher Markle. Premiering the English language version of Transylvanian writer András Visky’s JULIET with over two hundred performances worldwide. Starring in Visky’s I KILLED MY MOTHER, earning a Chicago’s Best Actress Orgie Award. Lauded by The Chicago Reader for turning even an “overwritten” and “implausible script” into “probing, harrowing, hallucinogenic truth,” for her Directorial work on VINCENT RIVER. 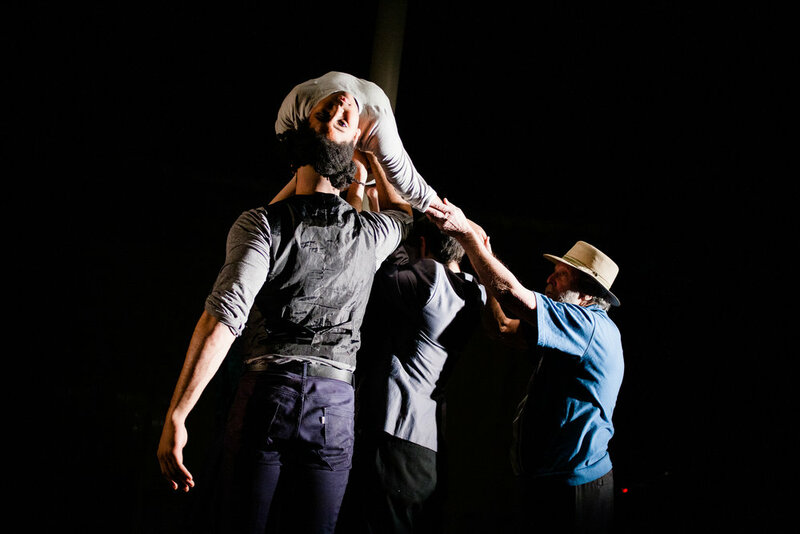 In 2013 Lorraine directed the world premiere of THE BINDING, a collaboration between Theatre Y and two acclaimed Serbian/Hungarian choreographers, which was a cover feature of the Chicago Reader. 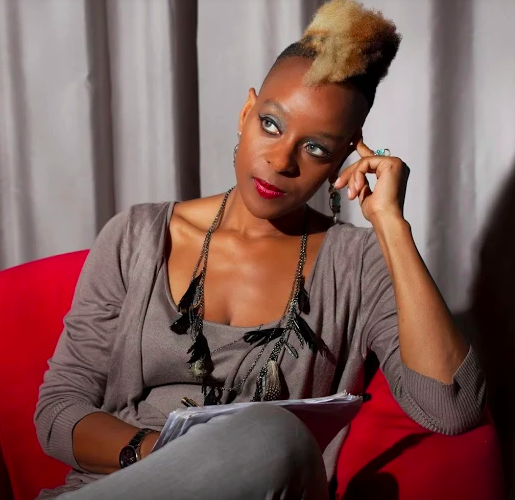 Collaborating with Georges Bigot for one year (2015-16), Lorraine developed the Theatre Y Ensemble of 12 actors, according to the traditions of the Theatre du Soleil. She now leads this ensemble to discover a common language and a new way to work, searching for a way to make theater without the “dictator”. Self-Accusation is translated from the German by Michael Roloff. The production team includes Kimberly Sutton (Sound Recording), Rachel Levy (Lights), Henry Wilkinson (Set), Rebecca Hinsdale (Costumes), Claire Alston (Dramaturgy), and Alanna Gerardi (Stage Management). Theatre Y Presents Self-Accusation by Peter Handke March 21-April 28, 2019. The Ensemble for Self-Accusation: Kris Tori, Adrian Garcia, Nadia Pillay, Pearl Ramsey, Zahrah Pillay, Howard Raik, Arlene Arnone Bibbs, Ishmael Klein, and Anthôny Battle. Nadia Pillay is a Chicago based actress that is pleased to return to the stage with Theatre Y. She was last seen in Theatre Y's production of Stories of the Body. Her most recent collaboration was with McKaw Theatre in Its Ok To Say Goodbye. She will be returning to the McKaw Theatres's stage this summer for the premier of Continuous Cut. Adrian Garcia is a proud Theatre Y ensemble member that has previously appeared in Stories of the Body, Yerma, and Macbeth. Other credits include Our Christian Nation (John Hancock Productions), The Wayward Women (We Three Plays), This House Believes… (Oracle Productions), A Midsummer Night’s Dream (Midsommar Flight), Twelfth Night, The Tempest, and Henry V (Unrehearsed Shakespeare Co.), among others. 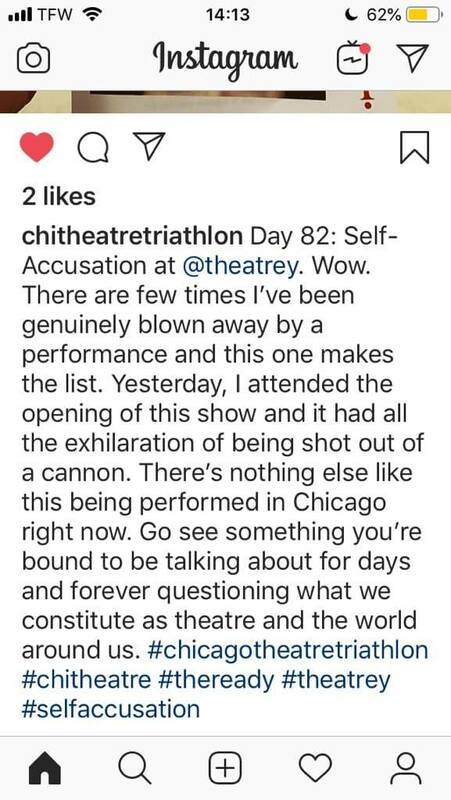 Following Self-Accusation, Adrian looks forward to building The Camino Project (working title) with Theatre Y for late Summer/early Fall of this year. Adrian has a rich background in theatre, improv, youth coaching and instructing, documentary theatre, and cheese plates. He studied theatre at Dartmouth College and abroad at the London Academy of Music and Dramatic Art. He is grateful for the opportunity to work with such brilliant, beautiful souls. He is grateful for your love and support. Arlene is happy to be making her debut at Theatre Y. Her last production was in The Elgin Theatre's production of Over The River and Through The Woods as Emma Cristano. This past November she appeared in Gallery Theatre's production of Last Romance and The Jewish Theatre of Elgin's production of Rosenstrasse as The Baroness. Arlene returned to her first love, the theatre, in 1997 when she retired to Florida after having run her own international advertising business. She immediately joined Curtain Call Playhouse in Pompano Beach and debuted in their first production, Last of the Red Hot Lovers as both 'Jeanette' & stage manager. She was involved in all aspects of that theatre, from acting and backstage work to Assistant Artistic Director.Her first love remained acting and she appeared in Romantic Comedy, My Fair Lady, The Sound of Music and Blythe Spirit. After her return to the Chicago area in 2013, she joined Theatre of Western Springs and has served on several crews, including Hospitality, Box Office, Paint & Costumes. She became TWS' Annual Costume Chair in 2014 and costumed Slaughterhouse Five, The Dinner Party, The Man Who Came To Dinner. & Rumors. Her acting roles at TWS were Louisa Cortlandt in Design for Murder in 2014 and Jesse in Calendar Girls in 2015. In September 2016 she played both Helen & Mrs. Hedges in Elmhurst's GreenMan Theatre Troupe's production of Born Yesterday and followed that with costuming GMTT's production of Nickle & Dimed in November. This past September she returned to the James Downing Theatre to reprise her role as Rose in Men Are Dogs, having played Rose in Old Ringers in September 2017. In 2015 she added film to her resume and since then has appeared in a number of student films for Colombia College, DePaul University as well as Northwestern and Loyola. She's also appeared in several short films, the most recent of which she shot in Milwaukee, WI called Walter's Wedding. Recently Someplace began playing on YouTube and she's done several stints on the Chicago TV shows....Fire, Med, PD, Empire and a brand new TV pilot which hopefully will be seen sometime in 2019, along with an episode of a new series called Proven Innocent. Zahrah is happy to return to the Theater Y stage. She was last seen in Theater Y's production 'Stories of the Body'. Zahrah has enjoyed play-writing and acting with Berger Parks Summer Theater Enrichment Camp. Previous productions include 'Jason and Argonauts', Wizard of G'Oz including improv for young people. As most typical 9 year old's she loves creating slime, painting, reading and loving her dogs. Howard is delighted to make his first appearance with Theatre Y in this most thought-provoking and intriguing piece of theater, and to be working with Melissa, Héctor, and our beautiful, talented, diverse cast. Howard was most recently seen as Lou in The Night Before The Night Before Christmas (James Downing Theater). Favorite roles include Nunzio in Over the River and Through the Woods (James Downing and Gallery); Morrie in Tuesdays With Morrie (MadKap and Gallery), Mr. Dussel in The Diary of Anne Frank (GreenMan), and Friar Lawrence in Romeo and Juliet (Albright). Howard has appeared with Aleatoric Theatre Company, Firsthand Theatrical, StageLeft, Polarity, Center Stage, Strangeloop, and St. Sebastian among others, and in several short films and videos. He is a member of the Reverb Ensemble. Ish Klein is a poet and playwright. Her play, “In A Word, Faust” has been performed in the UK, Brooklyn and New England; it was published by the Cambridge Literary Review. Her play, The Orchids, was a finalist for the Leslie Scalapino Award. She is also the author of the plays The Dee Men, and Drummer 41 and The Storm. Her poems have appeared on the Poetry Foundation website, and in magazines. Her published books of poetry are: Consolation and Mirth, Moving Day, and Union! as well as the chapbook “Every Animal Is Your Mother”. She attended the Iowa Writers Workshop for Poetry and Columbia University. Ish is very happy and grateful to be part of this production and looks forward to working with and supporting Theatre Y in the future. KRIS TORI was born in Pogradec, Albania and came to Chicago when she was 10. 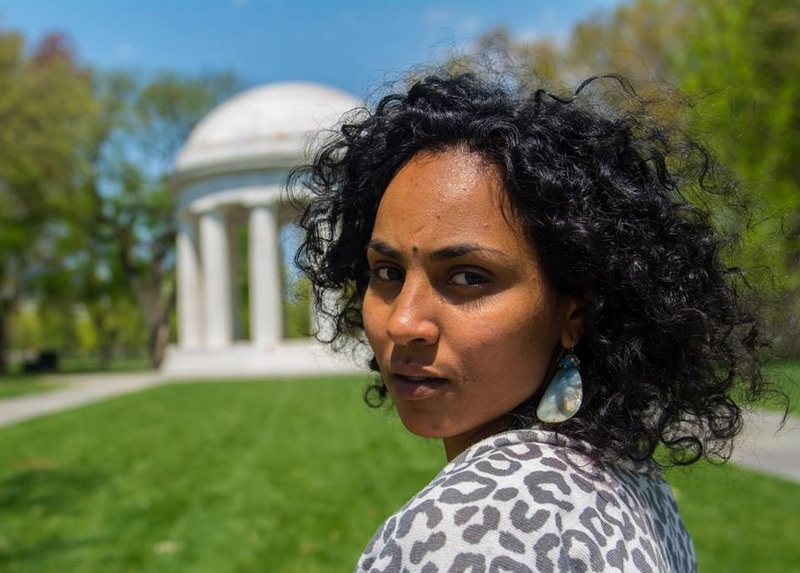 She has her BA from Columbia College Chicago and recently graduated from the University of Illinois at Chicago (UIC) with an MA in Latin American and Latino Studies. Her final thesis paper was based on the play La Havana Madrid by Sandra Delgado – specifically focusing on: Recreating Community through theatre (Memory and Place) What happens to memory when a place is gone? She served as the Research Assistant for the show. She is currently an ensemble member with Aguijon Theatre and Theatre Y. Her theater credits include Macbeth, Yerma and Stories of the Body with Theatre Y; Cervantes and Shakespeare: Mano A Mano, Tren Al Sur, The House of Bernarda Alba, Blowout, Yerma and Las Soldaderas with Aguijon Theatre; Delirium, Hecuba, and Marisol with Columbia College Chicago. She was recently seen in the bi-lingual production: Animales Nocturnos/Nocturnal Creatures directed by Marcela Munoz at Aguijon Theatre. Kris is super excited to embark on this project! Special thanks to her parents and grandparents for their unconditional support, professors, friends and a special shout out to her brother for always driving her to rehearsals and shows. Growing up on the South Side of Chicago, Anthony found his way to Northwestern where he played Big Ten football and studied literature and philosophy. After graduation, his desire to change the world led him to first teach English for 3 months in Indonesia, followed by a Fulbright grant to teach for 9 months in 9 months in Côte d’Ivoire, and then to reality TV where he was a contestant on season 13 of The Bachelorette. Anthony now sees the stage and film as the crossroads of these experiences where he can explore the full spectrum of his wandering and wondering body and imagination, bringing others along on the journey. creates challenging and innovative theater that addresses the contradictions of the human experience. The following values and practices form the foundation of our work: 1) We operate as in international laboratory, inviting artists from diverse cultures and backgrounds, because this exchange enriches our work. 2) Inspired by director Anne Bogart, we believe that “all great life-changing work made for the theater has historically been made by companies.” That is why Theatre Y has constituted itself as an ensemble devoted to experimentation and artistic excellence. 3) Continuous, weekly training is critical for the health and development of our ensemble. 4) We make work for our community and have pledged to remove all financial barriers that would exclude anyone.